shimmering celestial blue hues, Labradorite is a marvel to behold. A type of feldspar mineral, Labradorite features a distinctive kaleidoscope of color when viewed at different angles. 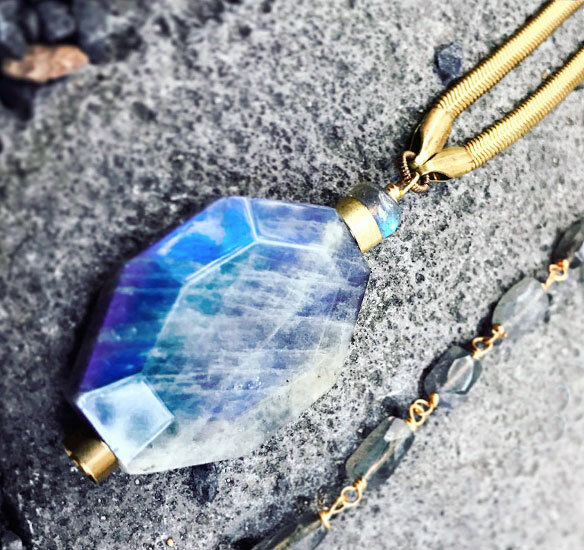 Called labradorescence, it happens because of Labradorite's uniquely layered structure and gradients. Light enters the stone and reflects back and forth onto the inner surfaces in a process called 'twinning' that disperses the light resulting in a dazzling display of iridescence. Labradorite deposits are found in Canada, Madagascar, Norway, Russia, India and the United States. It was first "discovered" in the Isle of Paul near Labrador, Canada by Moravian missionaries in 1770 who named it for the area. The gemstone was known, however, by older Inuit tribes through the centuries who called it "Fire Stone" and believed it fell from the Aurora Borealis lights. They in turn thought the stone was granted mystical powers of transformation and the ability to see into the spirit realm. Even today, Labradorite is considered a highly spiritual crystal and wearing it is said to enhance your mental and intuitive abilities like telepathy and clairvoyance while counteracting the effects of modern life like anxiety, negativity and stress. It is also reputed to be the top protector stone in the mineral kingdom, strengthening and shielding our aura with its array of shimmer and color. Healers and diviners have long connected Labradorite to the throat chakra, helping to restore the healthy balance of expression of our thoughts and beliefs. With balance, we can more readily bring our personal truths out into the world, often the catalyst for deeper emotional transformation. Labradorite's darker shades of blue are said to enhance the power of the truth, while lighter shades focus more on balance, ease and relaxation. Whatever your experience with this one-of-a-kind stone, it's undeniable that it exudes an ultra-feminine, sensuous quality that perks up our mood and looks radiant against the skin. We can all agree that we need to nurture our inner lives more than ever - And our new Spirit Blue collection reminds us of just that. 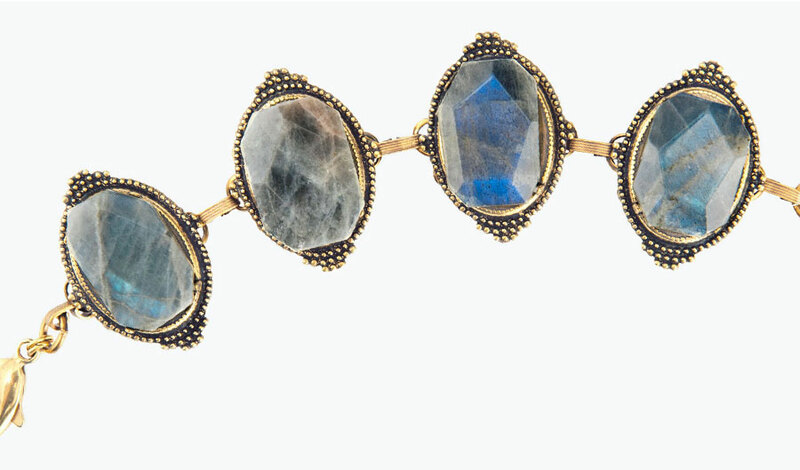 Complemented by simple antique brass accents, the delicate blue-gray Labradorite stones take center stage. As always, Jan hand selects each bead, which are both iridescent and a touch translucent - Perfect for earrings like the watery Imagination Hoops. 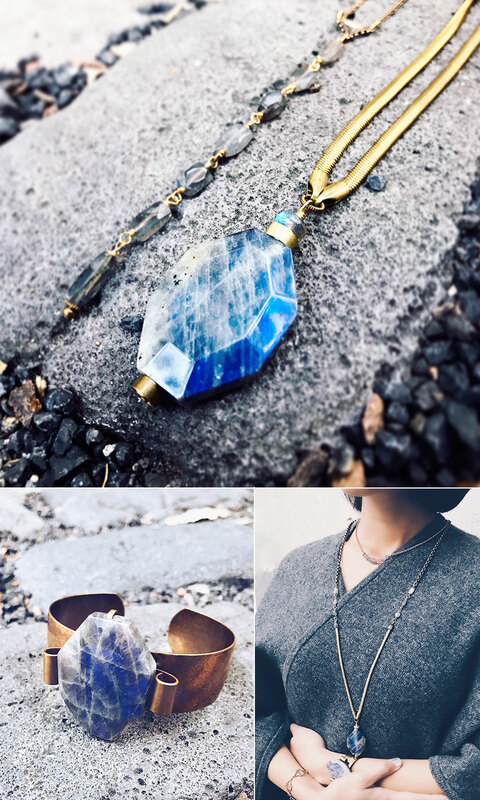 The statement pieces like the Pale Goddess Bracelet and Transformation Necklace have detailed metal work and larger eye-popping Labradorite stones - You'll be mesmerized as you shift the jewelry to light up different parts of the stone. The Labradorite Protector is flexible so that it can be formed into a curve or worn vertically for a chic modern look.